Kale is so in right now! 17 Oct Kale is so in right now! Kale oh lovely Kale.. It’s all about the Kale these days, it’s the hottest vegetable in town and one of the best for you. Its kale this Kale that, Kale Smoothies, Kale Chips, Kale Salads, the list goes one. I am in love with Kale, I have it at least 3 times a week, and love how it is so simple to prepare, and how tasty it is, and how good it is for you..
Why is Kale good for you and what Kale nutrients do for you? Fiber: Kale keeps you fuller longer. That will help keep your snacking and over eating at bay, which keeps your weight down (so kale helps you stay fit and trim!). Diets high in fiber-rich leafy greens, like kale, show decreased risks of cancers (such as colon, breast, prostate, ovarian, bladder and lung), as well as heart disease and osteoporosis. Vitamin A: An effective antioxidant, it boosts immunity and maintains healthy bones and teeth. Vitamin E: Acts as an antioxidant in brain cells, protecting them from free radicals. This will help keep your mind sharp! 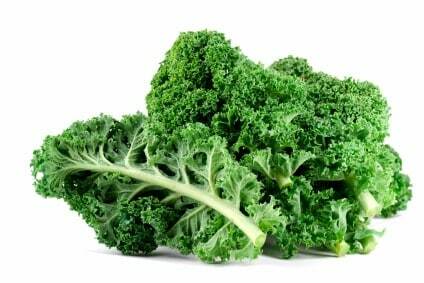 Vitamin K: Necessary to produce osteocalcin, a protein that strengthens the composition of our bones. Studies show that women with diets low in Vitamin K have significantly lower bone density. Vitamin K also prevents calcium build-up in our tissue that can lead to cardiovascular disease and stroke and is a key nutrient that regulates inflammation in the body. Preparing Kale: Like all greens, Kale will need to washed in cold water thoroughly. Whilst it is drip drying remember to cut out the big steam in the middle. Your Kale is ready to now cook and eat as you like. Below are couple of my favourite ways to use Kale. Kale Chips: Kale chips are so easy to prepare and yummy to eat. Lay the dried Kale leaves on a baking tray and sprinkle over some olive oil or my favorite coconut oil. Place in the oven on around 200 degrees and cook for around 20 minutes, or until crunchy (keep an eye on them as they can cook quite fast and you don’t want to burn them). When the leaves are crispy, sprinkle with sea salt and have as a snack or a side dish to your meal. Viola. Sauteing Kale: Place 2 to 3 cloves of garlic in a frying pan with a tbsp of coconut oil, on a low to medium heat and after 2 minutes place a big bunch of chopped kale in. Saute the kale for around 5-7 minutes (or longer if you like), and serve as a side for your meal. So fast, nourishing and healthy. Kale in salads: I like to grab a leaf or to of Kale and chop it up and add it in to my salad for lunch. One of my favorite salads, is Cos Lettuce, Chopped Kale, Avocado, Carrot, Tomato, Goats cheese and Olive oil and lemon juice dressing. Yummy!! Have fun eating Kale, brining more of this into your diet is going bring you more vibrancy, and energy. I just can’t get enough of this IT FOOD!!! © 2019 Roshini Mccartin. All Rights Reserved.